This is a good time to talk about weeds. 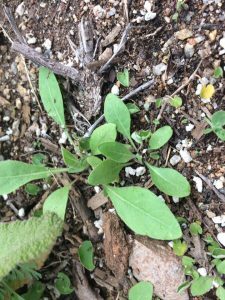 The rain has been very generous this year, bringing lots of seedlings along with it, but it can be hard to tell which are weeds and which are plants we want to keep. When sowing seeds in the ground, the safest bet is to germinate a few in a pot so you know what the seedlings look like. If that’s not an option, getting to know local weeds is a good idea. 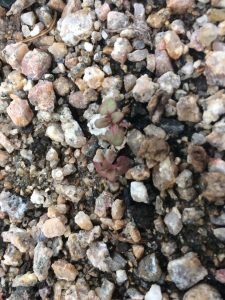 TPF’s former director of horticulture, Madena Asbell, put together a lesson on seedlings and most of these pictures and some of the text are from her. 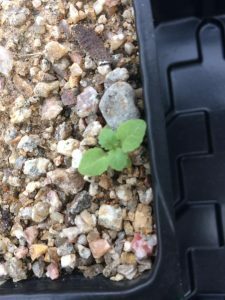 Thanks, too, to Jacob Goetz for sharing seedling pictures! Mustard covers much of our wild lands and is a very prolific weed. It’s best to remove mustard wherever you can. These low-growing weeds have naturalized throughout the state. In addition to being a noxious weed, Russian thistle is a fire hazard so it is best not to let it establish on your property. Poppies are fairly easy to recognize. 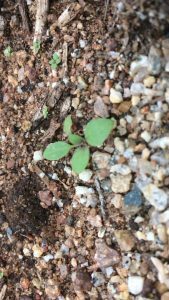 The very first “leaves” to emerge (the cotyledons) are slender and forked. The true leaves that follow are bluish in hue and deeply divided like the leaves of a carrot. Clarkia seedlings can be recognized by the red veins and margins of the leaves on the plant on the right. Notice the weed seedling on the left. The leaves are narrower and serrated. Clarkia are a good example of how a desirable plant can become unwelcome in the garden (a weed, in other words). 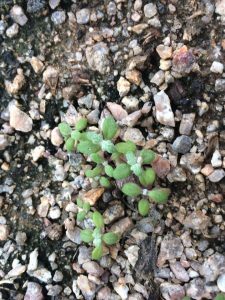 Most gardeners find they have to thin Clarkia seedlings or they become overrun with them. This California endemic is native to Los Angeles County and puts on a wonderful spring bloom. Here’s where it gets hard: telling one from another. The tidy tips seedling on the left has bright green linear (long and straight) leaves with lobed margins (edges). The unidentified weed has lanceolate (lance or arrow-shaped) leaves with serrated margins (edges) and small purple spots. Russian thistle has needle-like leaves while California poppy has carrot-like leaves. Chia has deeply lobed leaves with a warty surface texture. Its petiole (leaf stem) is often light purple/red and its leaf texture resembles laciniato kale. Filaree has alternating leaflets attached along a greenish-yellow petiole (leaf stem). Individual leaflets resemble cilantro or parsley. Mustard seedling on left with a Phacelia seedling on right. Phacelia campanularia leaves often have reddish veins, margins and petioles (leaf stems). Mustards do not. The leaves of grasses and blue-eyed grass (Sisyrinchium bellum, Iris family) look very much alike when very small. Seedlings of blue eyed grass will develop, flat overlapping leaf bases. The leaves of true grass seedlings do not form into a flat shape. You’ve probably seen enough unwanted grass seedling to recognize them in your sleep. Sometimes it can be hard to tell one seedling from another. Poppy and yarrow both have finely divided leaves so color may be the easiest way to tell them apart. Poppy is much bluer while yarrow is “spring green”. There are many more weeds that we could cover. UC Extention has a useful online identification guide for identification. Happy weeding! I thought for a while that it was rather attractive, but now that its offspring are all over the place, my enthusiasm has cooled. You must have great soil! This is my life right now! As I spend my first winter tending a small community native garden plot, it’s maddening telling friend from enemy, but very educational. Thank you! cream cups seedlings! they totally look like a grass or weed….. 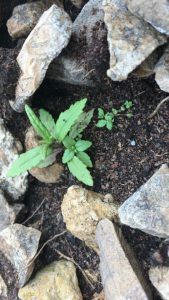 Try Yarrow, California Poppy, Red-Stemmed Filaree, and Fennel all sprouting next to each other. Talk about driving me crazy! This was in a nature preserve a couple years ago, between a native plant garden and a wild-weedy area. Chickweed…this is the bane of my existence, it’s gotten everywhere, I can’t keep up.